Following the Republican Party’s generally lousy national election performance in 2012, many GOP officials, politicians, and pundits offered various explanations for the defeat, and advice on how the Party could fare better in future contests. One predominant sentiment which has emerged from this introspection was that the Party should grow its tent by reaching out to constituencies who have traditionally not voted for Republican candidates, such as women, minorities, and youth. This sentiment was most visible in two reports issued by two prominent Republican organizations: First, the “Growth and Opportunity Project,” from the Republican National Committee (RNC), prescribed some ways to “modernize the Party” and “appeal to more people.” The second report, “Grand Old Party for A Brand New Generation,” a product of the College Republican National Committee (CRNC), outlined several youth-centered Party reforms. It is the latter of the two which is of concern here. The CRNC’s report uses responses from two surveys and several focus groups to gauge youth voter opinion on a variety of issues. While the report outlines a few intelligent improvements, much of its interpretation of survey data and consequent recommendations contain some notable flaws. One area of the report which raises particular concern is the section on “Reinventing the Brand.” Here, the CRNC uses survey responses to recommend a winning “narrative” for the Republican Party to adopt when reaching out to youth voters. Survey respondents were given a list of broad statements and were asked whether a candidate making those statements would be more or less likely to receive their vote. 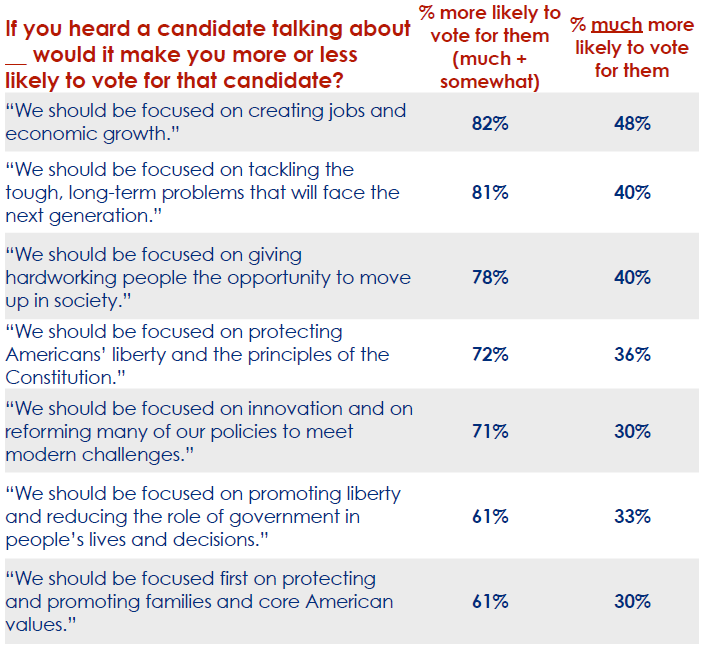 The CRNC then goes on to conclude that Republican candidates should pursue a messaging strategy more closely attuned with the three most popular statements listed, while focusing less on the bottom four; the underlying premise for this conclusion being that young voters are really conservatives deep down, and would vote for conservative Republican candidates if not for the Party’s lackluster branding. Ergo, a shift in branding would allegedly cast a more positive light on the Republican Party and attract hesitant youth voters. A more nuanced examination of these responses, however, reveals dire implications for any Republican trying to construct a youth-oriented campaign. The three top-polling statements are exceptionally vague—they are merely goals which any competent political philosophy should be expected to achieve (e.g., “economic growth,” “tackling tough, long term problems,” and “providing opportunity”). The four lower-ranked statements do not outline vague goals, but rather lay out particular methods—a means to achieve those goals. For conservatives, those concepts are inextricably linked: Liberty, limited government, American values, and constitutionalism are viewed as necessary tools to achieve the surveyed youngsters’ purported goals of economic growth and opportunity. If respondents were truly conservative, then we would expect all the given narrative statements to poll at roughly similar levels. This is not what we see, however: The respondents seem mysteriously unable to perceive the connection between conservatism and the economic growth and opportunity which they so desire. Which seems more likely, then? That the Republican Party’s struggles with regard to young voters are caused by deficiencies with the GOP’s brand, or that young voters simply reject conservative principles? The CRNC has apparently decided in favor of the former option; they believe that bettering the brand is the magic bullet that will turn around the GOP’s dismal electoral prospects. Admittedly, this may work for a short time. Even so, it would be a hollow victory, because such a strategy can only win by deceiving young voters: As the CRNC’s own survey data indicates, a candidate who champions conservatism is not more likely to garner young peoples’ votes than a candidate who speaks in vague platitudes. The CRNC’s rebranding strategy must invariably trick youngsters into believing that when Republicans wish to “focus on creating jobs and economic growth,” they intend to do so by means other than policies based on conservative principles. Ultimately, though, youngsters would catch on, the lie would crumble, and Republicans would be back to square one. This conundrum persists, however, only so long as Republicans wish to remain conservative. The path of least resistance, and truly the more honest approach to the rebranding strategy, would be simply to abandon conservatism. This is not outside the realm of possibility, as we have seen in the Congressional debates on immigration reform, the debt ceiling, and the budget; and in the RNC’s negligence and undermining of conservative candidates in Republican primaries, to list a few examples. If the Republican Party wishes to garner more of the youth vote and also remain conservative while doing so, then the CRNC’s rebranding strategy will not work—youngsters are simply not conservative enough. It is nevertheless imperative that Republicans attract new, young members to the Party, since winning elections and enacting conservative policies will be exceedingly difficult without them. However, this means more than just reconstructing the image and brand of the Republican Party. It will require no less than a widespread shift in the intellectual disposition of young voters. The CRNC’s recommendations with regard to social media platforms have some merit on this regard, but social media is only a part of what must comprise a large-scale, grassroots information campaign. Each and every conservative must reach out to his/her peers and introduce them to the conservative message. If the RNC/CRNC were really concerned with winning elections, they would refocus their energy on this endeavor, instead of trying to cut slices from an ever-shrinking electoral pie. This entry was posted in Political Theory and Social Science and tagged brand, College Republican, College Republican National Committee, conservatism, conservative, CRNC, CRNC report, focus group, government, Grand Old Party for A Brand New Generation, narrative, Politics, rebrand, rebranding, report, Republican, Republican National Committee, Republican Party, republicans, RNC, survey, voter, voters, young, young voter, young voters, youngster, youth, youth vote on March 17, 2014 by Jacob Fishbeck.